There is a new video that has been floating around facebook and twitter this week. I have seen countless friends and colleagues approvingly posting and commenting on the video. Yet, I find myself troubled that we are sinking into the usual false and (fruitless) dichotomy between “spirituality” and “religion” or “Jesus by himself” and “religion.” I’ll admit that this guy can rap well, but I believe several of his arguments might be ill communication (Hey that’s like rap, right!?) I realize by using ill to mean “whack,” I leave myself open for the same criticism as Will Shortz. It is unclear what this guy means by the “religion” that Jesus came to abolish. He doesn’t mean the Law, does he? Jesus didn’t come to abolish the Law. This is certain by Jesus’ own admission (Matt. 5.17). What does he mean by religion? Does he mean that all religion is in the realm of pretending? It’s just not clear to me. It’s true that Jesus did receive opposition from religious people, but it doesn’t mean he didn’t practice his religion. He was a faithful Jewish man who participated in Synagogue and observed the holy days of his community. I don’t this guy is making that distinction. As a friend of mine points out: St. Augustine tells us that the word religion comes from the word “ligare” (“connection”/”ligament”). He points out that “Religion is being reconnected with or re-bound to God.” As the same friend says, through Jesus, we are “religioned” to God. And I would add we are “religioned” to each other through our baptism. It doesn’t work to make Jesus a vigilante superhero out on his own in the name of individuals being saved. Jesus grew up as a part of a community, living into the practices of that community, and when he began his ministry he began to assemble a community around him made up of people who were both part of his community who were Jews, while extending the community to Gentiles. This rapper/poet has divorced Jesus from his community, to those people with whom he practiced his faith. After making some comments about Christians not needing to be Republicans (no argument there, though I would add nor do they need to be Democrats), he goes on to send up of a volley of the usual indictments of “religion.” Starting wars. Building up infrastructures while people who go hungry. Casting out those people whom Jesus would likely want to be his bosom friends. This is all true, but it doesn’t mean that people who are “spiritual” or who “just like Jesus” don’t do this either. Rather, he fails to understand the church as the place where sinners come to get sanctified. It should be no surprise that in a motely crew such as this that some trouble might be stirred up. Yet, that is our story. That is who we have been all along, and the good news is that God is always calling us back. But God doesn’t call us back on our own. God calls us back together so that we might experience reconciliation. The rapper/poets’s next comment really gets my gander. He claims that God calls “religious” people “whores.” While it is true that God does accuse Israel of playing the whore, it isn’t clear that this is because they are “religious.” Rather, God is typically speaking about the worship of other gods or the failure of the Israel to care for the orphan and widow, the most vulnerable among them. On the first count, they are “religioning” themselves to other Gods (Hosea 9.1). On the second, they are failing to “religion” themselves to vulnerable persons (Amos 5.21). But they aren’t whores just because they are part of a worshiping community who follows the Law. He accuses religious people of failing to fix their problems and masking them. I wasn’t aware that any of us were able to fix our problems on our own. This is why the church was created to be a community. We were created to live in a community of love and forgiveness, where the Holy Spirit and one another can help each other grow in love of God and neighbor. It may be very clever to say that religion is like spraying perfume on a casket, assuming that those who practice the same thing regularly are faking it. I would argue instead that there are times when we all have trouble holding ourselves up, and it is at that very moment when we need our brothers and sisters the most. We need them to say the words of the creed for us when we can’t say them ourselves. Sometimes, it is all we can do to come and say the words, lay ourselves before God, and let his body and blood enter into us as he draws us into him over and over again. He criticizes religion for being only “behavior modification.” I don’t think that this is entirely wrong, but I’m not clear about why it is a bad thing. If our beliefs and our actions are intimately tied together, then religion properly practiced finds us living out our faith practically. This seems to be what this guy wants, yet he is bashing it here. What is the “core” he speaks about? Is it just believing the right thing? If it is, he might want to check himself before he wrecks himself because he’s contradicting himself (See that was like Ice Cube). Seriously. I wouldn't mess with Ice Cube. He then claims “not to be judgin’,” but then of course he does just that with his “just sayin’.” You are “judgin’” rapper dude. You are doing the same thing that you accuse “religious” people of doing. You are creating insiders and outsiders based on your own set of criteria, rather than the Scripture and Tradition of the Church passed down from the apostles. If I can’t rap and I like the regularity of the liturgy for the changing of my life, I don’t fit your mold. No real argument with him that the church should be a “hospital for the broken.” Yet, he seems to often equate “religion” with being part of the “church.” He confesses he is one of those who was fake in the church, and acted like a different person each week. Yet, is that part and parcel of being religious? I would argue that “spiritual” people like being spiritual because it doesn’t require them to make any concrete changes in their lives. It sounds like the rapper/poet has been “religioned” to God in a new way. Good for him. But I’m still not sure that means that Jesus doesn’t like religion or the church (which, I’m not sure how or if these equate for this guy). I just don’t think Jesus likes fakers. Nor does the rapper/poet. On this, we agree, but it sounds like we are defining religion differently. He next returns to the age-old suggestion that before Jesus came, all those poor Jewish people just followed rules all the time and life was terrible for them. Then, Thank God, Jesus came and got rid of all the rules. Except, that as I said, Jesus didn’t come to do away with the Law, he came to fulfill it. He didn’t come to do away with the rules, he came to make it possible for us to follow them. It is nearly anti-Semitic to suggest that all those Jews were miserable rule-followers before Jesus. If that is true, then how does Psalm 119 exist? Over a hundred verses about the beauty of the gift that is God’s Law. Further, Jesus didn’t get rid of the commands. He made them more demanding. Has this guy read the Sermon on the Mount? Yet, as John Wesley said, Jesus’ commands are covered promises. Whatever Jesus asks us to do, he provides grace sufficient for it to happen. But it is an historical and theological error to suggest that the Jewish faith was a dead faith full of empty rules. Jesus practices a Jewish faith. He did call out some of the practices that had gone awry, but he didn’t get rid of all of them. How is it that religion is a man-made invention? Are the practices of the church what the invention is? He says, “Religion says do,” “Jesus says, done.” It appears that we feel here the eschatological pinch between the “already,” and the “not yet.” Rather than the “either/or” of the rapper/poet, the reality is that we experience it as “both/and.” Jesus says both “do” and “done.” Jesus has won the victory, yet we are responsible for living as he commanded us to through his grace in the mean time. That’s what all those parables are for, like the parable of the talents, the wedding banquet, etc. He also says religion makes us “slaves” while Jesus sets us “free.” I think Scripture would affirm that actually what happens is that we find out that we were serving the wrong master. That’s why Paul calls himself a slave to Jesus all the time. We aren’t freed to do whatever we want, we’re freed to do the right thing because we are serving him instead of false gods. I guess what it comes down to is that this guy did a pretty clever video with a decent rhyme. The only issue is that he falls into his own trap. He spends a lot of time talking about how bad a certain group of people are, the “religious” folk. The problem is that he’s bringing down the same judgment on them that he criticizes them for bringing on others. He also doesn’t seem to have a very good understanding of what religion actually means. Again, it seems to have something to do with works righteousness and hypocrisy, but that doesn’t have to be what religion means. It might just mean practicing what we preach, which rapper/poet guy is all about. The Church is not perfect, but the Holy Spirit created it and upholds it. Jesus is often painted as a lone ranger destroying a dead Jewish faith, but that is not who he was. He was a faithful Jew, and God’s covenant with the Jews isn’t abolished either. Since this guy likes quoting Romans at the end of his video, he might want to consider flipping to chapter 11. The last thing I can’t abide by is the smugness. People who hate on what they want to call “religion” always do it in a way that makes them seem better, more insightful, and more faithful that “religious” people. That’s self-righteousness, dude. “Not to be judgin’,” but I’m pretty sure you just rapped something about that being a problem. You may or may not be aware of a large conversation swirling around The United Methodist Church these days. It’s no secret that The United Methodist Church, like many of the other mainline Protestant denominations, is declining. Well, at least in the United States it is declining. For years and years now, the conversation about what is wrong and what can be done has gone on and on. The most recent effort to deal with this issue has been the Call to Action Steering Team, organized by Council of Bishops and the Connectional Table of the United Methodist Church. This task force has looked across the connection, and they have tried to zero in on signs of “vital congregations” in order to help other churches perhaps figure out why they may or may not be doing well. Not surprisingly, much of the conversation has revolved around numbers. Now, it isn’t that numbers aren’t important. We keep track of the number of folks who attend here each week. If we notice a dip or an increase, we try to analyze that data. However, many who are watching the conversation in our beloved United Methodist Church are beginning to wonder not whether we should measure. They are wondering whether we are measuring the right things. As a pastor, I have been trying to keep up with this conversation closely because it will have real effects on the life of local churches. That is why I was particularly interested to see an article in the United Methodist Reporter from Bishop Joe Pennel, who was our previous Bishop here in VA. I am now 72 years old and I have been a pastor since 1959. As I look back over my years as a pastor I find myself wishing that I had organized my congregations around worship, searching the Scriptures, more Holy Communion, deeds of mercy and kindness, prayer, meditation and Christian fellowship. I now see that these are the most important means of Grace. The confessional nature of his article bowled me over. This man, this pastor, this Bishop, was basically saying that he was as caught up as anyone else in “numerical growth and institutional maintenance,” but as he reflects on his ministry, he wonders if that was always the best thing. Instead, he finds himself suggesting there might be other things worth measuring in local congregations. Worship. Reading Scripture together and individually. Taking Holy Communion more frequently than once a month. More deeds of mercy and kindness. More prayer and meditation. More Christian fellowship. This is radically different than much of the numbers-focused discussion around our church. What gives? The church is declining in the US, and we are going to find ourselves in big trouble. How is taking Holy Communion more often going to do us any good? How is meditation going to take us to the next level? Deeds of mercy and kindness sound well and good, but what are we going to do about all this decline? Are we just going to stick our heads in the sand and let the church fall to pieces? I don’t think Bishop Pennel is suddenly suggesting that numbers don’t matter. Rather, Bishop Pennel is gesturing towards the church’s difference. The church is different than any other organization, business, or civic group. To put it another way, I think that Bishop Pennel is gesturing towards the church’s existence as both vineyard and wedding banquet. For the last two weeks, Jesus has been in conversation with the chief priests and elders. For these last two weeks, Jesus tells them parables including vineyards. The conversation has been amping up. In each case, Jesus pronounces judgment on the chief priests and elders because they have failed to work in the vineyard. In the first case, the tax collectors and the prostitutes will go into the kingdom of God ahead of them because they were to sons who said they would work in the vineyard, but then changed their minds. The insiders find themselves behind the presumed outsiders. In the second case, Jesus describes the way that the vineyard will be taken from them and given to people who produce fruits of the kingdom. In fact, the chief priests find themselves held accountable “for Israel’s history of rejecting the prophetic bears of [God’s] invitations” to begin bearing fruit in the vineyard. The vineyard will be taken away from the insiders and given to the outsiders because the insiders aren’t producing fruit. There has been a lot of talk of fruit these last two weeks. This is often the word we use in the church for accountability: fruit. And this is not incorrect. We should be bearing fruit. It is clear that Jesus expects us to bear fruit. There is no question about this. So at first, we might think, “The Call to Action is right on. We need to get to work in the vineyard.” And that aspect of the Call to Action makes a lot of sense. I don’t want to sound like I am completely bashing the Call to Action, and I don’t think Bishop Pennel is either. United Methodists have ridden the wave of cultural familiarity and cultural accommodation for long enough. It is, indeed, time to get to work on some things. Then all of a sudden Jesus changes the image to a wedding banquet. How do you move from a vineyard to wedding banquet? How do you go from work to partying? Parties don’t produce a lot of fruit. They don’t get much accomplished. They seem sort of like a waste of time when there is good work to do out in those vineyards, right? Yet, Jesus finishes his debate with the Pharisees comparing the kingdom of heaven to a wedding banquet. This wedding banquet parable rehearses familiar themes from the last two weeks, amplifying them to a fever pitch. 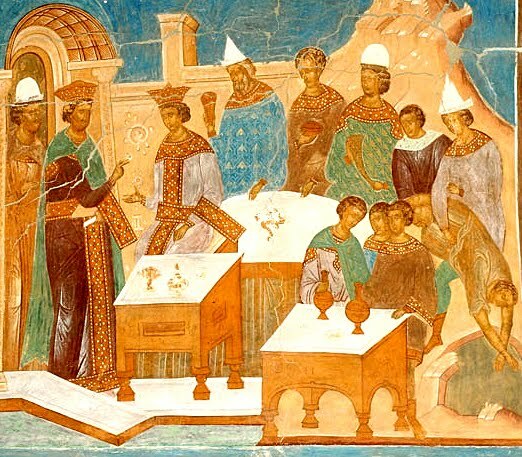 A king throws a wedding banquet for his son. He sends out slaves to invite guests to the banquet. The guests won’t come. He tries again. Some ignore the invite. Some go work on their farms or businesses. Some invitees even get openly hostile and kill the slaves who are inviting them to this banquet. Jesus is again rehearsing the history of the prophets and Israel’s rejection of the prophets. The king then sends more slaves, this time to “invite everyone you find to the wedding banquet (Matthew 22.9).” The slaves invite everyone they find, the good and the bad, and so the wedding hall is filled with guests. Again, the presumed outsiders, the good and the bad, are now found to be occupying the space of the insiders. What is the criteria in the banquet? What is the measure of who gets in and who doesn’t? Where is the fruit of those the slaves gather on the street? They are folks who simply respond to the invitation of the king’s servants. They are both the good and the bad. The only criteria, it seems, is a willingness to respond to the King’s call to come to the wedding banquet of his son. The distinction is between those who rejected the invitation, and those who accepted it. No fruit is mentioned. The next piece of the parable is even more confusing. The king comes in and noticed someone isn’t wearing a wedding robe. In response, the king promptly throws this guest into the outer darkness? What?! Wait a second, so this person, who would have had no way to prepare for the banquet, is suddenly thrown out because he or she isn’t dressed right? Even if we interpret the gown to be righteousness or the new life we put on in baptism, it still strikes me as strange. How would they have been prepared? Yet, somehow they aren’t found to be appropriate to the gathering. How do we measure that? The key is the many are called, but few are chosen. Lots of people will show up to this banquet, but not everyone is chosen. Yet even that feels confusing, doesn’t it? All of these people who didn’t expect to be called to this banquet show up, yet there is still some element of chosenness? Which is it? Do they respond to the invitation? Or are they chosen? If this distinction is between those who rejected the invitation and those accepted it, why is chosenness still a factor? What is the measure here? The wedding banquet suggests that there is simply more than just measuring fruit at play. It is simply more than what we do or do not do. The wedding banquet is what theologians call an eschatological image. You get one gold star today for learning the word “eschatological.” You get two if you learn how to say it! “Eschatological” means the “final things.” The wedding banquet is an image of the banquet that we will enjoy forever with Christ and the communion of saints. Jesus has moved the conversation from the past and pulled back the view to look across all of history. And in this view, the work of the kingdom is crucial, but there is an element even more crucial than work. It is grace. The tension, especially the tension that we sense in this one person who isn’t dressed right for the banquet is a tension that has existed across the history of the church. The tension is between being called and responding to the call. Some elements of the church focus on the call. God is sovereign, and so God knows and chooses those who will be part of God’s covenant community. The response to this image is that when we recognize ourselves as one of those people is obedience. Then, on the other side of the spectrum there are those traditions that focus on the response. We must accept the call for it be effective. Our free will and agency is crucial to our decision. Think of the hymn, “I have decided to follow Jesus! No turning back!” We march around the sanctuary singing, “I have decided to follow Jesus!” So which is it? The reason this tension cannot be resolved is that the answer is both. It is two sides of the same coin. It is iridescent grace. Iridescence is the property of certain surfaces to change color when looked at from different angles or when the illumination of the surface is changed. This is popular on some cars. When you look at the car from one direction, it looks green. When you look at the car from another direction it is blue. Which is it? Blue or green? This is the tension we feel in this passage. Did God choose me as a follower? Yes! Did I use my free will to freely accept that invitation? Yes! John Wesley fiercely held to the notion that “is free in all, and free for all.” Wesley accounted for the tension we are feeling through his description of “prevenient grace,” the grace that comes before. Prevenient grace is that grace that God offers us, it is that grace that works in us even before we even recognizing it. Without that grace, we wouldn’t even know how much trouble we are in. Yet, we must respond to that grace, even as we understand that the grace is what frees us to respond in the first place! Does your head hurt yet? Put different, when we look at it from one angle, we see God’s sovereign choice in calling us. When we look at it from another angle, we see that way in which God wants us to respond to that invitation. It is iridescent grace. It depends on the angle at which you look at it! The wedding banquet image is a vision and glimpse of the banquet that we will enjoy when there is a new heaven and new earth. In it we see God at work in ways we cannot imagine, ways that God invites us and through grace enables our free response to God’s invitation. The banquet is for the bridegroom, who is Christ to whom the church, to whom we as members of the church, are bound. Were we chosen? Yes. Did we freely respond to the invitation? Yes. Further, the good and the bad in the parable remind us that we can’t judge or know precisely now what is each other’s hearts. It is only the one who gives the banquet who knows this, and it is only through grace that we are even at the banquet in the first place. It reminds us that even as we measure fruit, we recognize that our measurements are not eternal judgments. Where does this leave us with Bishop Pennel’s article? Is the Call to Action all wrong? Should we resist all of it? Is it not of God? I don’t think Bishop Pennel thinks that. I don’t think that. Fruit is important. Fruit is necessary. There are valuable elements of the Call to Action. There are times when it is appropriate to measure our work. Yet, the banquet is a remind that at the end of the day is not squarely on our shoulders. Rather it is on the shoulders of the one who bore a cross for us. It is on the shoulders of the body we find ourselves in through our baptisms. It is on the shoulders of Jesus Christ, who is ultimately the head of the church. Our work, our participation, our fruit only comes through the often surprisingly, subversive, and wild nature of God’s grace. When we focus only on our numerical growth, perhaps we find ourselves in danger of making numerical growth our idol to which we sacrifice all of who we are as church in the name of growth. We turn our churches into competing McDonald’s franchises rather than glimpses of the heavenly banquet. We get so focused on the work, on best practices, on being effective, on fruit, on keeping up with other churches that we forget that the church doesn’t belong to us. It belongs to God because we are invited, shaped, and formed into the body of Christ by the work of the Holy Spirit. The prevalence of the Call to Action’s work, the fact that it seems to be where a large share of he church is throwing its weight is what is unnerving because it places all that weight on us in a way that forgets the unmerited gifted nature of our membership in this body. The unmerited, gifted, nature of our membership in this body is different than any other membership we encounter. It is what makes it different than governments, civic clubs, country clubs, or any other associations we find ourselves. What Bishop Pennel is describing is a fuller vision of the church that focuses more deeply on the banquet nature of the church, which we only see in glimpses in the here and now. He is describing the practices of the church where those glimpses have been found throughout the life of God’s people. In worship, prayer, and Scripture. Most especially Holy Communion, which is actually a participation in the future banquet we will enjoy with the communion of saints and Jesus. When we come to the table, we dine with whole church, just not the church we can see. When we come to the table, we learn not to depend only on what we can do because it is in the normal elements of wine and bread that we receive grace. Grace we don’t deserve. Yet grace nonetheless. For Bishop Pennel to wish that he had organized his congregations around more Holy Communion is powerful because it is to suggest that it matters. It matters even though it is a gift we receive. 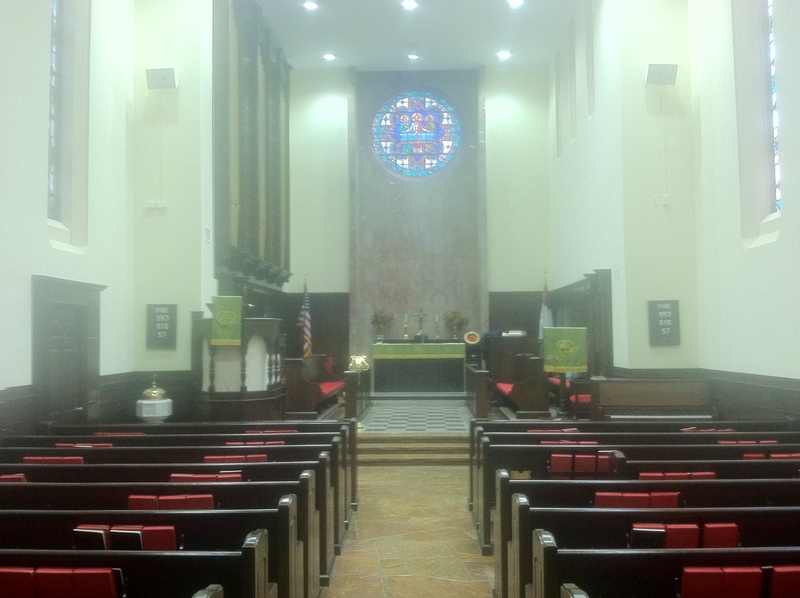 It is radical because he is suggesting that if we want to see revival in the church, then we need to avail ourselves of the means of grace, of which John Wesley called Holy Communion the “grand channel.” When we find ourselves focused on other things and forgetting about worship, scripture, praying, and the sacraments, we are in danger of running aground. What about fruit? Fruit is important. Notice that Bishop Pennel mentions deeds of kindness and mercy. He is naming that when the church organizes itself around the grace offered in the banquet, we are nourished to get back to work in the vineyard. That vineyard work is crucial. There are fruits of the kingdom to be borne. Yet, it isn’t all vineyards. It is, principally, first, and foremost, and party. A banquet. A celebration. And it is one we didn’t expect to find ourselves invited to. Yet, here we are, in this sanctuary. Celebrating coming back into our space of worship. Our place of party. Our place of celebration. Our place of the Holy Feast where it is truly Christ who meets us in the table of Holy Communion. And when you go to a good celebration, and good party, a good banquet, we don’t do a lot of measuring. Rather, we tell stories about our experience. It is qualitative rather than quantitative information that we share when we go out into the world. When you describe our service today and the excitement we have shared, you will likely tell it as a story, rather than as raw numerical data! What I think Bishop Pennel is suggesting is that when we take care of our spiritual practices, the numbers take care of themselves. When we avail ourselves of all the means of grace at the banquet, the vineyard work pours out uncontrollably. But we actually have to take care of it. We actually have to focus on the practices and not pretend that they are important to us simply, so that we don’t have to change or do anything new. It doesn’t mean that we don’t need to measure anything. Rather, we may just need to also keep track of some other things. Like how often we are taking communion. How many hours we spend reading scripture. How much time and money we spend in mission and ministry in our community and in our world. Were we chosen for this banquet? Yes. Did we freely decide to come to this banquet? Yes. It is iridescent. It depends on how you look at it. Yet, no matter which we way look at it, we are thankful for the party. We are thankful for the celebration. It is a celebration where we feast on the Word as it is read, proclaimed at the lectern and pulpit, and we eat and drink it at the table. And then we find ourselves in the streets, inviting more people who don’t think they belong to the feast, whether they are good or bad. What would the numbers look like if that really happened? Bishop Joe E. Pennel, “Better Ways to Measure Churches,” in United Methodist Reporter, http://www.umportal.org/article.asp?id=8245, cited October 9, 2011. Pennel, “Better Ways,” cited October 9, 2011. Richard E. Spalding, “Pastoral Perspective,” Feasting on the Word, Year A, vol. 4, (Louisville: Westminster John Knox, 2011) p. 164. Susan Eastman, “Exegetical Perspective,” Feasting, p. 167. Andrew Purves, “Theological Perspective,” Feasting, p. 164. John Wesley, “Free Grace,” §2, in John Wesley’s Sermons: An Anthology, ed. By Albert C. Outler and Richard P. Heitzenrater, (Nashville: Abingdon, 1991), p. 50. Also available online. “[A]ll the ‘drawings’ of ‘the Father’, the desires after God, which if we yield to them, increase more and more; all that ‘light’ wherewith the Son of God ‘enlighteneth everyone that cometh into the world,’ showing every [person] ‘to do justly, to love mercy, and to walk humbly with [his or her] God.” John Wesley, “The Scripture Way of Salvation” §I.2, in John Wesley’s Sermons: An Anthology, ed. By Albert C. Outler and Richard P. Heitzenrater, (Nashville: Abingdon, 1991), p. 373. Also available online. John Wesley, “Sermon on the Mount VI,” III.11 in John Wesley’s Sermons: An Anthology, ed. By Albert C. Outler and Richard P. Heitzenrater, (Nashville: Abingdon, 1991), p. 232. Also available online. Notice again what is happening. As Jesus reveals who he is, we begin to get a better sense of who we are supposed to be. This is where we start to get uncomfortable. How can I be this person? How can we be this kind of people? It all seems too much, doesn’t it? This seems like a like of work for people who are supposed to be saved by grace alone, doesn’t it? But that depends on how you understand grace. Grace is a tough word. It is a word that is thrown out a lot when church folks get together. “We are saved by grace alone.” “God’s grace is sufficient.” “We receive God’s grace in the sacraments.” Grace is definitely one of those “church” words. And that isn’t a bad thing. It is not a bad thing for the church to have a distinctive language. It is not easy to just walk into church and be a Christian. Even folks who would say they have been Christians their whole lives would be able to say that. In fact, they might assert it more strongly. To be a Christian is to learn a new language. Our experiences in this Christian community call the church are shaped by Scripture as well as the traditions of the church passed down to us. The reason we are giving our third graders Bibles today is to help them in the process of learning the Christian language. Not only is there a verbal language, but also there is a language of gestures and actions that are shaped by our participation in this community. Outside of the church baptism makes no sense. We say some words and dump some water on a person. Big deal, right? Just as importantly, serving vulnerable people is given a different meaning. We are not doing it only out of sympathy. The folks receiving help are not objects of pity. They are not just people we help to feel better about ourselves. In this community Baptism is our initiation into this new family that is the body of Christ. In this community we are in ministry with vulnerable people because we recognize in each of them the image of God. We are called to love God, and because we love God, we love what God loves, which are our neighbors. We recognize that our neighbors are none other than Jesus Christ beckoning to us. To grow as a Christian is to learn a new language of words and action. Grace can mean a lot of things to a lot of people, but our understanding of grace is distinctly shaped by our participation in the body of Christ. When we divorce it from that life, we again run the risk of creating a false idol, grace that looks like whatever we want it to. I don’t know if you’ve noticed a theme, but we are still pretty good at creating idols for ourselves. They may not be fashioned out of wood or stone, but they are still as pernicious as ever. Grace is represented as the Church’s inexhaustible treasury, from which she showers blessings with generous hands, without asking questions or fixing limits. Grace without price; grace without cost! The logic essentially goes that because grace is freely offered to us, our reception of grace need have little or no effect on the shape our lives. Whatever we do is covered by grace. Yet, this seems to be exactly the opposite of what we encounter in our scripture for this morning. Picking up our cross and following Christ does not sound like an encounter with Jesus Christ that requires no response. Losing our lives so that we might find them does not sound like an encounter with Jesus Christ where our regular activity remains separated from our faith, where our activities remain relatively unaffected. This is where learning a new language comes in. The church often finds itself misunderstood by the world because we can somehow come to the conclusion that to pick up our cross and follow Christ, to deny ourselves is actually the character and shape of grace. Think about the hymn we sang at the beginning of the service: “Lift High the Cross.” The cross to us is a sign of victory. To everyone else, this was a sign of execution. It was a sign of death. To wear a cross in Jesus’ time would be as if we were wearing little electric chairs around our necks now. Yet, because and only because it is where Jesus died, it is a sign of victory. We see victory in the cross because when Jesus was resurrected, he conquered death. The sign of death then becomes a sign of life. This does not make sense outside of the community called the Church. If we let our desire to be respectable in the eyes of the world consume us, we let the world set the agenda for what grace is. Our understanding of grace only comes through our answer to Jesus’ question, “Who do you say that I am?” We can only understand grace because know Jesus. When we truly encounter Jesus, and we see him for who he is, we begin to realize there is a cost. Yet, because it is Jesus, we are willing to do anything to follow him. We don’t care about the cost. It is the kind of grace that causes a fisherman to drop his nets, abandon everything he knows. Cheap grace is grace that requires nothing of us because it is grace without Jesus Christ. The way we understand grace can make a lot of difference in the way our lives move forward. Grace is good news. But it isn’t good news because it means that we can go on as we please. Rather, it is good news because it comes to us as God’s gift for us to become the kind of people God created us to be. We do not find cheap grace in Jesus Christ. Rather, as John Wesley suggested, Jesus Christ’s commands are covered promises. It is true that much is required. It is true that to be a disciple of Jesus Christ is costly. Indeed, our whole lives are required. It is a call to follow Jesus Christ to the cross. It is a call to lose our lives. For goodness sakes, Jesus tells us that we are to be perfect as his heavenly Father is perfect! It sounds like an impossible task. And it would be if it weren’t for grace. Real grace, costly grace, is inseparable from Jesus’ commands because it is our reception of Jesus’ grace that enables us to grow into the kind of people who can live out those commands. We are a people who believe in responsible grace. God offers grace to all freely, yet God expects a response. We wouldn’t know how badly we need Jesus without grace, yet when we are convinced of how mired in sin we are, we are called to repentance. We say “yes,” to Jesus. Whether that is a dramatic moment we can remember or whether we grew up in the church and gradually came to faith in Christ, our “yes” is not the last word. God is not done with us. Conversion is not a one time event. The life of a Christian is a life of constantly being more and more converted into a disciple of Jesus Christ. That is what we United Methodists call sanctification. At every moment of growth, we realize how much more growing we have to do. As we become more and more familiar with the language of being a Christian, the more we realize how much more we have to learn about loving God and loving our neighbors. Grace is offered as the channel through which Christ shines more brightly in our lives. What does it look like to live as people who are the recipients of costly grace? It takes practice. And where does such practice come? It comes in the liturgy of the church through which we pass in worship each week. Think of a rough rock made smooth as water passes over it. The practices of the liturgy and the grace of Jesus Christ makes us smooth, less resistant to Christ’s call. Week in and week out, our gathering for worship may not always be incredible. Every sermon may not have Ricky Bobby in it. Yet, over time, we are smoothed out for Jesus. When we leave the church, we are prepared to live as a Christian in the world. Think of the liturgy like improvisational comedy. When you go to an improv show, everything looks like it is done off the cuff. Yet, improv only comes after practicing the games that make improv work. We are trained in the liturgy and strengthened by Christ’s grace in such as way that we can improv Christian responses to situations we encounter. Discipleship is no different. Learning to carry our cross. Learning to lose our lives. This comes as we gather together, to hear the stories of who we are, to pray, to pass peace, to sing the hymns of our faith, to remind ourselves of who Jesus is, so that we can be reminded of who he calls us to be. Most importantly, as we practice what a Christian life looks like in worship, we receive the ultimate help because we share in Holy Communion, which John Wesley described as that “grand channel” of God’s grace. We are nourished by Christ’s body and blood through the power of the Holy Spirit, so that when we move out into the world we live as if we really believe that Jesus is who we say he is when we recite the creeds. Christ offers us grace. Because we are members of the body of the one who offers us grace, we ourselves become instruments of his grace. Not instruments of cheap grace. Grace the shows the world that Jesus is that treasure in the field that we sell everything to buy. As instruments of grace we become channels, sacramental people through which good news is proclaimed to the poor, release to the captives, recovery of sight to the blind, and the oppressed to go free. In a world that seems rocked by earthquakes, blown around by hurricanes, made low by crashing stock markets, we have the incredible task of proclaiming the year of the Lord’s favor. This isn’t going to make sense to a lot of people, but it may make a difference in the lives of many people. The danger here is that since we understand grace as a call on our lives and the lives of our brothers and sisters in the church, we may lose patience if we don’t see the progress that we think we should in others. To live as a Christian is to hold in tension holding one another accountable with the reality that we are all on the way towards being the people God calls us to be. It means that we cannot lord accountability over one another as a way to put one another down or assert dominance over one another. It is not a way to shame people we don’t like out of the church. Rather, being instruments of grace means we get close enough to one another, that we love one another enough, to help one another on the journey. It means that when we pick up our cross, we do not do so alone. It means that when we lose our lives, we are drawn into the lives of others because we become members of a body that is larger than ourselves. At the end of the day, costly grace means that we enter together into a love worth dying for. Randy L. Maddox, Responsible Grace, (Nashville: Abingdon Press, 1994), pp. 84-87. Dietrich Bonhoeffer, The Cost of Discipleship, 1995 Touchstone Edition, (New York: MacMillan, 1959) p. 43. John Wesley, “Upon Our Lord’s Sermon on the Mount V,” §2.3, John Wesley’s Sermons: An Anthology, (Nashville: Abingdon Press, 1991), p. 211. Maddox, Responsible Grace, p. 86. Wesley, “Upon Our Lord’s Sermon on the Mount VI,” §III.11, John Wesley’s Sermons, p. 232.